Generations ago I believe your next door neighbor was as close as family. These days, you're lucky if you even know your next door neighbor's name - first, because people just aren't that nice anymore and second, because people don't stay in one place that long. But, I was lucky. I grew up in a house sandwiched between two sets of great neighbors. On the left was the boy my age who lived with his father and grandparents who were ultra sweet. He and I played tag and soccer, rode our bikes together, and climbed the tree in his front yard. Then, there was the precious older couple on the right...the couple in the red house. I adored that couple growing up. I would walk over to Mary & Charlie's house to visit and Miss Mary would feed me fig newtons. I rode my bike down their long driveway (sprained my wrist once there too) daily. I ate Miss Mary's cooking, played with their grandkids, watched Charlie tinker with his RC Airplanes or other projects, and just go over to visit and chat. Mary passed away 6 years ago when I was a senior in high school. That was tough. For years I had watched the two of them walk their dog together down the street almost every night and all of the sudden, it was just him. Fifty-five years of love and marriage with those two and suddenly, his sweet wife was taken to be with the Lord. But then on Saturday, the other half of that legacy left this life too. I choose not to go into the details of Charlie's passing because it's not my place but this past week has been rough, especially on my mom who still lives next to the red house. My husband and I went up last night so we could be at the service today. When we pulled into the driveway and I looked at that red house that holds so many childhood memories, I broke down. Hubby held me as I let it out before we went inside. I had to be strong for my mom as she was already struggling. Charlie lived a long life of 84 years. For 55 years of it, he had the love of a magnificent woman. He loved the Lord, loved his children and grandchildren, and was a GOOD neighbor...truly good, in every sense of the word. He was always there to lend a hand, to help out. He was a true servant and will be truly missed. You don't find neighbors like that anymore. You just don't. I'm going to miss seeing him out on his front porch swing, the swing that his kids told my mom she could have, the swing he built, the swing that he and Mary used to sit on in the backyard that he later installed in the front, the one thing that holds sentimental value to my mom. I don't think I'll ever be able to look at the red house the same, knowing he's not there. But I will tell you this...whoever has their mansion in Heaven next to him, is a very lucky one indeed...because in this life - a good neighbor is just hard to find. Has it truly been ten years? It's crazy how most days I can't remember what I had for breakfast but on that fateful day 10 years ago, I can tell you exactly where I was and what I was doing. I was a freshman in high school in Miss Vallance's biology class in the "square" building at Vanguard High in Ocala. The bell was about to ring for 2nd period when another teacher on the hall came and told our teacher that a plane had hit one of the twin towers. "Yes, I had CNN on and just heard the news. Turn on your TV." We had no idea that by the time the bell rang and we made it to 2nd period, that another plane would hit the 2nd tower. As we filed into Ms. Meierhenry's algebra class, I felt the mood shift completely as our eyes focused on the TV screen at the front of the room. We sat down in our seats, our eyes glued to the two smoldering buildings. Not much was spoken in that hour and a half. No lesson was taught. We all just sat there watching our country change forever...watching the skyline of New York City morph into something unrecognizable. We watched in disbelief as the first and then the second tower crumbled to the ground. 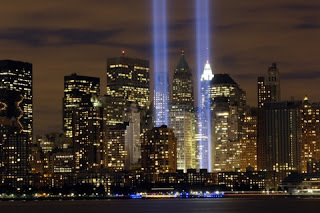 I remember trying to comfort a friend who knew her older brother worked in one of the towers and though she couldn't be certain which floor, she knew he was up there in one of the top ones. She was scared and I believe made a few trips to the restroom as she was overcome by fear and anxiety. Yes, he was at work that day, but he was on one of the lower floors when the plane hit and was able to get out...one of the lucky ones. I remember wondering why and asking questions. I was only 14. I didn't understand terrorism or what the ramifications would really be because of this day. 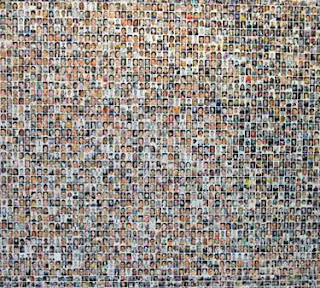 And while none of my loved ones were taken, I believe we all suffered heartbreaking loss that day but I also believe we are all survivors. September 11, 2001 is a day that we will all remember. 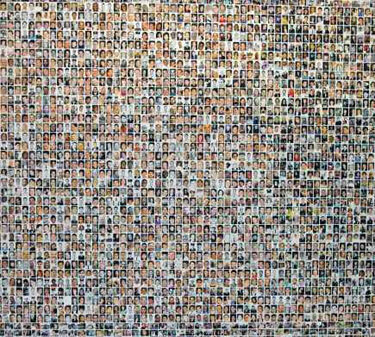 It is a day that changed so many lives and altered so many fates. But it is a day that brought the people of our country closer and I think, for a fleeting moment, caused us all to forget about our differences and stand by each other. Yes, America changed that day. But now, as you reflect back...can you see that it changed YOU permanently? I honestly don't think I can. But as I look back during this 10th Anniversary, I am reminded yet again that I am not promised tomorrow...a lesson I was reminded of not too long ago. Life is too short to sweat the small imperfections and it's too short not to celebrate the small victories. Here's to those that lost their lives and those that lost the lives of loved ones. Here's to those that gave their lives trying to save others and to those that became heroes in that Pennsylvania field. You are gone...but not forgotten. Wow! It's been quite a while since I updated...and not for lack of wanting to. I just never seem to find the time. Since going back to work, life has been a whirlwind. I feel like from the time I get up to the time I go to bed, I'm just running around like a chicken with my head cut off...or running around trying to catch myself. I never do. It's almost the end of the 3rd week of school with the kids and so far, I'm loving this year. Yes, we still have loads we have to do...even more so than last year since we are Correct 2...again. BUT...my attitude is so much better. I don't feel like I'm drowning with no way out. I'm actually happy to go to work. Wait, is this me writing this? Ha! Gabriel is growing at ridiculous speeds. I am constantly amazed at each new development. One day, he's trying to crawl but not quite able to and the next day, he is all over the place. One day he can only scoot backwards in his walker and then the next day he is zooming through the house. One day he can only pull up to his knees and the next he's pulling up to standing on everything he comes in contact with. He sleeps 8-10 hours a night, waking intermittently needing his binky because he can't find it or because his diaper is too full (he pees constantly). He's so happy in the morning when he wakes up for his first bottle. How a human being can be so happy that early in the morning is beyond me but it sure does give me a boost of energy to see his smiling face. He loves being home with daddy everyday and boy do they have fun. I love hearing about their day and I love to see Gabe smile when I walk in the door. I still do his nighttime routine but daddy and I also pray over him every night...praying for his safety, the day of his salvation, and then other things. I think it's one of the sweetest moments of my entire day...especially when he looks up from his crib and smiles up at us while we're praying-unless he's fallen asleep during his last bottle and then he's already in dreamland. Two weeks ago, our neighbor across the street passed away after complications of a major surgery. His wife, thankfully, has had family down to be with her for a few weeks but we're going to definitely have to go over a lot more often after they are gone. We heard the ambulance coming one night and just knew it was for him. Jason took her and her daughter to the hospital that night and he passed the following morning. It's been so strange not to see him out and about. It's weird to see the arm chairs they gave us along with the end table and know that we won't see him out on his mower and he won't be coming to mow our yard. He'd been grumpy those last few weeks but he was a good man and a good neighbor to us. I won't forget the brownies he made for us when everyone was over here painting our house for us. But I pray I'll see him again in the kingdom. This past Saturday we went for a quick trip to my Pop & Nana's. They got to enjoy some time with him where Pop TRIED to impress Gabe with his magic tricks (just don't think Gabe was that into it yet-but he did turn a $1 bill into a $20 for Gabe's piggy bank). We had a delicious lunch and after lunch Pop just stared at his sleeping great grandson. That was a sweet moment. It was a nice time and I'm glad we have the ability to take trips like that. Tomorrow is Friday...yay! Saturday I plan on straightening up some of the house and then Sunday is $5 day at the zoo so we're going on a family outing. I'm excited to see how Gabe reacts to his first trip to the zoo. I'll be taking lots of pictures with the new camera my hubby got me for my birthday. Well, getting sleepy so I think I'm going to call it a night. Sweet dreams! Pop singing Gabe his famous song. Pop & Nana with Gabe.